Imagine printing out molecules that can respond to their surroundings. A research project at the University of Washington merges custom chemistry and 3-D printing. Scientists created a bone-shaped plastic tab that turns purple under stretching, offering an easy way to record the force on an object. “At the UW, this is a marriage that’s been waiting to happen – 3-D printing from the engineering side, and functional materials from the chemistry side,” said Andrew J. Boydston, a UW assistant professor of chemistry. He is corresponding author on a recent paper in the American Chemical Society’s journal of Applied Materials and Interfaces. Gregory Peterson and Michael Larsen, UW doctoral students in chemistry, created a polymer, or plastic made up of many repeated units strung together, and fed the soft plastic into the UW chemistry lab’s commercial 3-D printer. One print head contained polycaprolactone, similar to what a 3-D printer company sells as Flexible Filament. 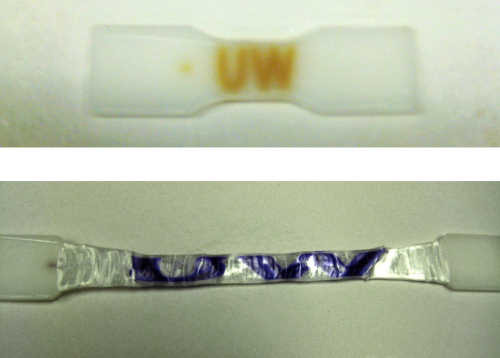 The other print head contained a plastic that is 99.5 percent identical but the UW team made occasional insertions of a molecule, spiropyran, that changes color when it is stretched. The printed tab is a piece of white plastic with barely visible stripes that turn purple under force. It acts as an inexpensive, mechanical sensor with no electronic parts. The whole device took about 15 minutes to print from materials that cost less than a dollar. The sensor might be used to record force or strain on a building or other structure. Boydston would like to develop a sensor that also records the speed of the force, or impact, which could allow for a football helmet that changes color when hit with sufficient force. The project is part of a recent collaboration between Boydston’s group and co-authors Mark Ganter and Duane Storti, UW mechanical engineers who have developed new 3-D printing materials and techniques. Different instructions can program the machine to print the plastics in any configuration – with the color-changing part in stripes in the middle, completely encased in the other plastic, or in any other desired shape. Varying how the plastic is made could yield molecules that respond in different ways. “Maybe the material isn’t currently under stress, but it had been several times prior to your observing it. And so these types of materials could record that load history,” Boydston said. Boydston will continue collaborating with Ganter and Storti, to plan and create more 3-D printed objects that incorporate designer molecules. The 3-D printing technology offers new possibilities, he said, for individualized medical implants or other custom shapes that incorporate engineered molecules that respond to their environment. “This is definitely an area that we want to continue to expand into,” Boydston said. The above story is based on materials provided by University of Washington, Hannah Hickey.